Martha Stewart to the rescue for the holidays. A particularly great idea if you just went from a drip coffee maker to a single cup pod machine… what to do with all those paper filters up in the kitchen cabinet. Why not make a holiday wreath out of them? 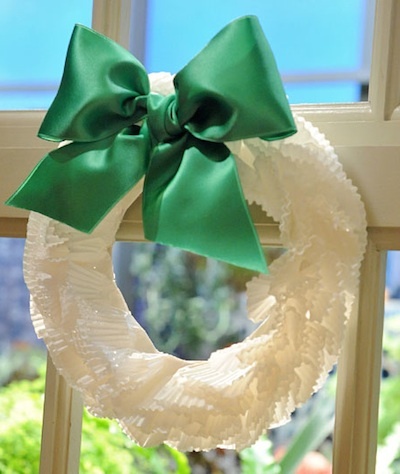 The project is actually pretty quick and takes the filters, something to poke the holes with, a bit of ribbon, a paper plate (read the directions, you can substitute for different size wreaths) and a glue gun… the ever crafty ‘glue gun’. She frowns on people taking her plans from her sites and books, so the next step is to jump over to her site and see the ‘very’ simple instructions. The only age restriction is the need for the hot glue gun… maybe a kids glue stick could be used, will have to play with that. Next post: Amazing Espresso Quantity Mix Graphic!